I like to cut and paste: Die Versions + Great Impressions: A Blog Hop! 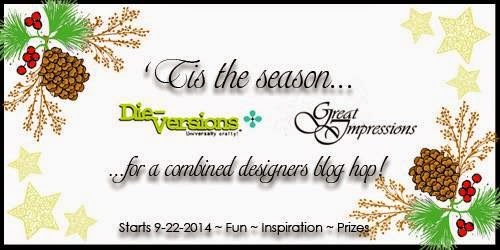 Welcome to the Die Versions + Great Impressions designer's blog hop! We've got both talented teams hopping today with a chance to win prizes from both of these craft suppliers! Our theme for this hop is "Tis the Season" so get ready to see some beautiful holiday creations! You have have arrived here from Emilia van den Heuvel's blog. If you haven't and would like to hop with us, please go back to the Die Versions blog to see the entire hop list and to start at the beginning for the maximum chances to win! 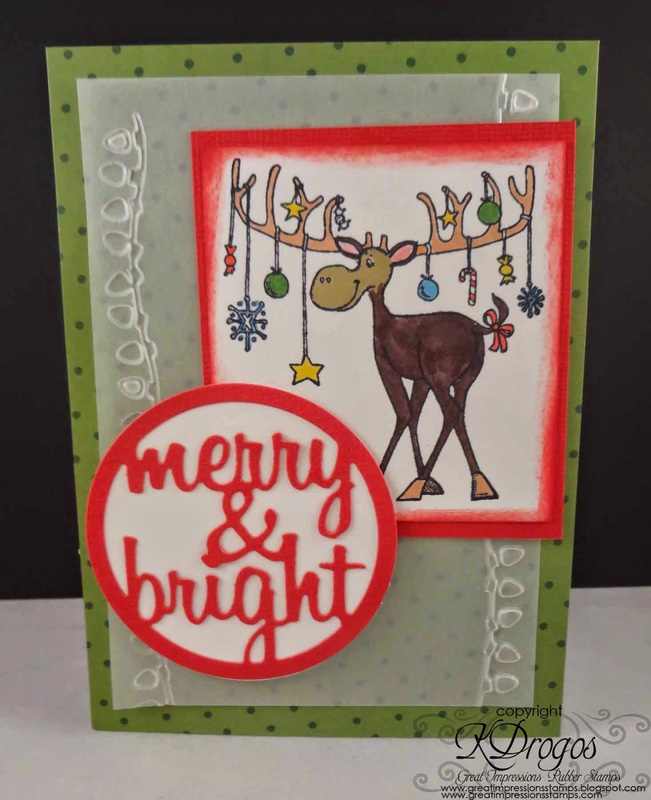 Here is the first card that I made with Great Impressions Stamp: H236 Merry Kiss Moose and Die-Versions Sweet Spot Die Cut: DVSS-012 Merry and Bright. 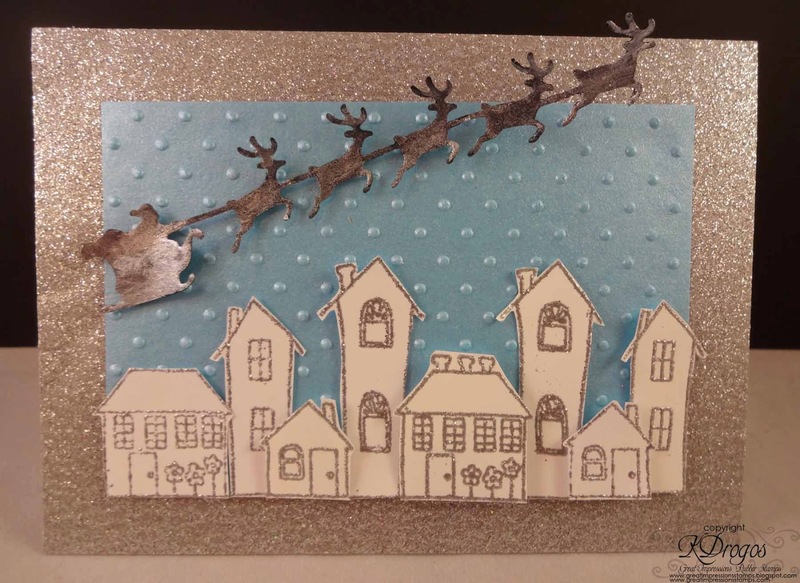 For my second card I used Die-Versions DVW-400 Whispers Santa's Reindeers and Great Impressions Stamp G487 Homes. Using my Homes Stamp, I stamped it twice with Versamark and then used silver embossing powder. I cut out each set of houses. For three of the houses I used pop dots to give a little dimension. I used pop dots for Santa too. Santa and his reindeer are cut out of black cardstock. Then with a little water and Perfect Pearls I painted the Santa and his reindeer so they would have a nice shimmer. Thanks for stopping by today! Your next stop in the hop is Irit Shalom's blog! We hope you're inspired all along the way! Grab all the goodies used from the Great Impressions and Die Versions stores! Both of your cards are beautiful!! Love that moose!! So fun!! Both cards are so festive and fabulous!! Your cards are wonderful! I love that cute moose!! These are beautiful! I love love love that moose!!!!!!!! Adorable cards...so festive and fun! Katy, you rock! What fun! I love what you've done with the GI stamps and the DV dies! It's been a fun time, hopping with you! I love that moose stamp and the santa sleigh die. Your cards are very cute! Such fun cards. The moose is just adorable and I keep wondering how I would use the word spots and now I know. I like the town in the other card. Nothing says Christmas like Santa flying over a town. I love the Die-Versions Sweet Spot die with that adorable reindeer stamp!! And your Neighborhood image with Santa and his reindeer is delightful! Great job! Both of your projects are so pretty. Love the reindeer flying over the houses and a great night sky too. These are both fabulous! Love the fun reindeer on the firs and the fun scene on the second! Both cards are georgeous. Love your stamps! Two beautiful cards, especially love that reindeer!!! yay for fun deers.. such fun cards.. Awesome cards! Such beautiful designs...it makes me want to get started on Christmas cards now, lol! Awesome inspiration! Love that cut moose! Fabulous cards! Love them both! What festive cards! Love that delightful moose and that Santa and sleigh! Two adorable cards. I absolutely love that moose image! LOVE the houses and the popping up really makes them look dimensional. What can one say about that moose other than.. I need him!! Too cute!!! Esp love that second one. Such a vintage feel to it, which I love!! Fantastic background texture for the snowy sky!! what an adorable moose and winter scene! These are really cute, sweet cards, Katy. Great composition. Oh my goodness I just love both of your cards. I thought I had seen all of the GI stamps, but I missed that house one....gotta check it out! So happy to be "hopping" with you! Fun cards! I really love those houses! Looks great with the Santa and his reindeer flying over!